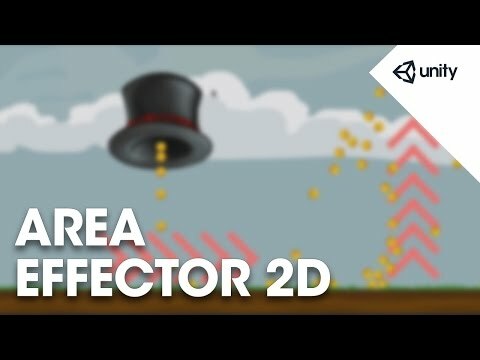 In this lesson we explore the Area Effector 2D component which allows you to add 2D physics forces to objects which enter a trigger volume. which trigger or collide with it. in a top-down driving game. to our game object ArrowsRight. which is attached to ArrowsUp. also has a 2D collider. with Used By Effector checked on this game object. checked and set to true. the forces set in the area effector settings. Area effectors are designed to be used with triggers. is in contact with the source. the area effector 2d the following settings. effected by this effector's forces. For more on layers please see the information linked below. Here the effector is effecting everything. it will clamp to 359.99.
incrementing in a counter-clockwise direction. the object will be pushed directly to the right. and if set to 270 it will be pushed down. to the object's local rotation. the direction which the force is applied in. while it remains within the trigger volume. push towards our second effector. The force variation here is set to 0.
ranging from 0 to the amount specified. can subtract between 0 and that number. we've set the drag and angular drag to 0.
to 2D rigid bodies that enter the effector's trigger volume. in the target object's rigid body 2D settings. so that we can then move them directly upwards. through the trigger volume and out of it to the right. we've modified our scene slightly. and then is moved upwards by ArrowsUp. and the force target is rigid body. and therefore does not case rotation. as we increase the drag value.